Over the years, I've collected no fewer than five outstanding brownie recipes that I've made, adored, and would use again in a heartbeat. Yet I find myself on a never ending quest to try new variations on a beloved theme. This quest recently led me to Chocolate Truffle Brownies. These are a basic brownie with walnuts topped off with a layer of beautiful, rich ganache. This particular recipe is an ideal match for people who don't like cloyingly sweet desserts. The use of bittersweet chocolate, especially in the ganache layer, makes these treats feel more sophisticated than most. When all else fails, you really can't go wrong with ganache. Make sure you leave plenty of time to make these. The preparation itself isn't lengthy, but there is cooling time required for both the brownies and the ganache. These can be made up to a day ahead of time; just cover and store at room temperature. 1. Position a rack in the center of the oven and preheat to 350°F. Line 9 x 9 x 2-inch metal baking pan with foil, leaving overhang. Spray foil with nonstick vegetable oil spray. Combine 6 ounces bittersweet chocolate and butter in medium metal bowl. Set bowl over saucepan of simmering water and stir until chocolate and butter are melted and smooth. Remove bowl from over water and cool chocolate mixture until lukewarm, 5 to 10 minutes. 2. Whisk sugar, eggs, vanilla extract, and salt in large bowl to blend. Whisk in chocolate mixture. Stir in flour, then chopped toasted walnuts. Transfer batter to prepared baking pan. Bake brownies until tester inserted into center comes out with moist crumbs attached, 26 to 28 minutes. Transfer pan to cooling rack and let brownies cool completely. 3. Bring cream to simmer in small saucepan over medium heat. Remove from heat. Add remaining 6 ounces chocolate to hot cream and let stand 5 minutes to soften, then whisk until melted and smooth. Pour chocolate ganache over brownie sheet in pan and spread to cover completely. Let stand at cool room temperature until topping is set, about 4 hours. 4. Using foil as aid, lift brownie sheet from pan. Fold down foil edges. Using large sharp knife, cut brownie sheet into 25 squares, wiping knife with hot moist cloth after each cut. Arrange brownies on platter and serve. Yum! This looks fabulous...and dangerous at the same time. I will have to tuck this recipe away for a special occasion. Whoa! 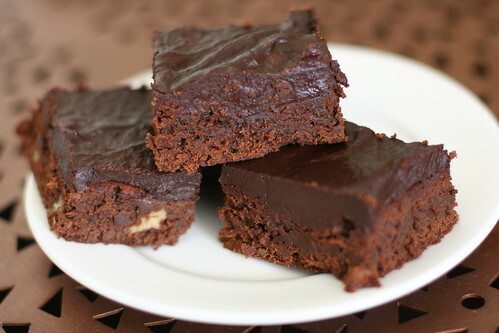 Those brownies make me drool @_@ They look so delicious. I love truffles, have to save this recipe. Thanks for sharing! I first discovered Baked's brownies on your blog and love them. Now I think I'll have to try these! These look decadent. With a name like Chocolate Truffle Brownies, I know they are good! Back in the '70's when Ghirardelli chocolate first showed up on grocery shelves in the East we used to make brownies (todiefor)from the recipe on the side of their cocoa powder bag-- I have it written among my first recipes. Ever try them? Bethree: I haven't tried them but that sounds divine, thanks for sharing! My stomach grumbles... Looks good! Oh wow! Ganache and brownies! I think you just gave me my new favorite recipe! Definitely going to try these out over 4th of July. My family will love it! Could you share the other 5?